D’Ardennen. (The Ardennes). Gripping family crime drama. Sometimes a local film is receiving good press, quite understandably so to support the local film industry even if the film itself is not that good. For instance, check out some of the rave reviews Wim Vandekeybus’ hugely disappointing ‘Galloping Mind’ received. If the critics are losing their credibility when it comes to local films, it’s not a good idea in the long term. 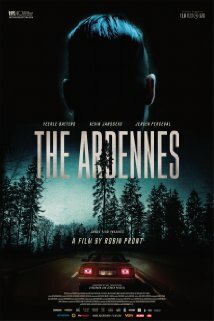 ‘D’Ardennen’ (The Ardennes) marks the directorial feature length film debut by Robin Pront and is the latest release from production company Savage Films (Rundskop, a.k.a. Bullhead, and the above mentioned Galloping Mind). There was quite a hype surrounding the film at the time of its release. After a somewhat slow start there was a short moment I was afraid the hype was not deserved, but there was no reason to. It seemed the movie -like the lyrics of that opening song of Friends- was somewhat ‘stuck in second gear’. But Pront is just taking his time planting seeds and confidently lets scenes play out in single, rather long takes, giving his actors the time to really get into their characters. Once the film reaches the scene in a nightclub where the argument ‘who is the greatest Belgian, Eddy Merckx or Jean-Claude Van Damme?’, is settled once and for all the film really ‘kicks’ into gear. By then most of the main characters have been introduced. Kenneth (Kevin Janssens) has just been released from prison after solely taking the rap for a bungled home-jacking, that also included his now ex-girlfriend Sylvie (Veerle Baetens) and his brother Dave (Jeroen Perceval, who also wrote the script adaptation based upon his stage play). A love triangle emerges that will be settled in the Ardennes, the location were past joyful family holidays had taken place. The plot is set-up a lot more subtly than is usually the case in these type of crime drama’s. Even when the character Joyce appears, a drag queen played by Sam Louwyck, the tone remains rather serious. Another director might have let things go more over the top. Pront seems to be going more for the dramatic intensity of a James Gray (‘Little Odessa’, ‘The Yards’, … ) or David Michôd’s ‘Animal Kingdom’ than for a more Coen brothers like humorous approach although the end result is somewhere in between. A fine confident debut that makes you yearn for more. < Previous Citizenfour. The Oscar winning Edward Snowden documentary. Next > Knock Knock: Who’s That Knocking at My Door, Eli Roth’s remake of Death Game.